I’m pleased to feature the artwork of Katey Berry Furgason on the first of the new Art + Science Series here on the biocreativity blog. I first met Katey when she submitted three paintings from her Portraits of the Microscopic series to Art.Science.Gallery.’s EVOLVE exhibition last spring. Last summer, I had the immense good fortune to visit the studio she in Santa Fe she shares with husband Scot, to learn more about her inspirations and process. 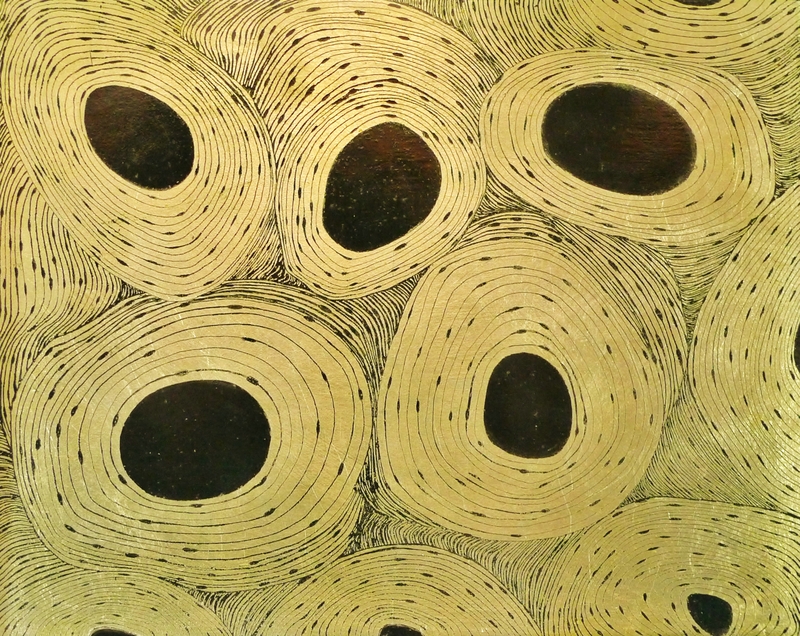 To The Heart, a solo exhibition of Katey’s paintings and sculpture, runs February 14 – March 23 at Art.Science.Gallery. in Austin, TX. [biocreativity] Welcome to the biocreativity blog, Katey! What type of work do you do? [KBF] I believe all life is a series of collaborations. We are the results; past, present and future, of collaborations in which we find meaning and purpose. This belief structures how I live and how I work. When I am working I am engaged in collaboration with my subject. My subject presents its physical facts to me and I respond. I search for its essence, its core, its heart and its possible transformations. My role is to discover what my subject was, is and can be. [biocreativity] Where do you see yourself on the biocreativity spectrum? [KBF] From 16-18 years of age I studied human anatomy, drawing and sculpture at the Art Student’s League in NYC to get some classical training before entering into the BFA program at Hunter College in NYC, which was known to lean heavily towards the conceptual. At Hunter I studied studio art and philosophy. Although my schooling was focused in the Arts, being raised by a father who was a chemical engineer, inventor, entreprenuer and lover of experiments (especially on the kitchen table, when he wanted to show me, say, what distillation was) filled me with the wonders of life and beauty of discovery. My father’s approach to life filled and nourished my childhood, it was founded in his love of what science showed us, in the beauty of all that was known and the wonder of all that was yet to be discovered. Although my formal academic training did not include scientific study, the entirety of my childhood was bathed in it. [biocreativity] That sounds like an amazing experience, and I can certainly see how it has inflenced your work. How do you currently view the interaction of arts and sciences? How do you think one informs the other? [KBF] The idea of Infinite Divisibility, which is the belief that there are infinite parts to every whole is widely held by scientists, philosophers, economists….and by most of us who give it some thought. This idea applied to the notion of Truth gives us this: The Whole of Truth, the entirety of All existent Truth is infinitely divisible = there are infinite parts/pieces/bits/aspects which make up the Whole Truth. Scientists, artists, philosophers, teachers, parents, etc. (all of us), to some extent, seek to understand some part(s) of Truth in order to make our lives and existence more meaningful. Artists and Scientists make it their life goal to seek part(s) of our Whole Truth with the clear purpose of sharing their discoveries and observations – these bits of Truth – with others, to build upon human understanding and depth of experience. The artist and the scientist set out on paths of discovery, often not knowing (even if they think they do!) where the path will lead and what will be uncovered. In methodology they may differ (artists do not have to adhere to the scientific method) but in purpose they do not. In purpose they share a goal, an outlook on life, a belief in, love, and importance, of; discovery, wonder, questions, observations and seeking. Seeking bits of Truth that fascinate us, that inform us, that make our lives richer. In other words, very simply, both Artist and Scientist say to all who will hear them “Hey! I discovered something! I want you to know about it!”. Insect collaboration sculptures by Katey Berry Furgason. [biocreativity] I think about that process of discovery a lot, and being both an artist and scientist myself, I definitely see the parallels in purpose you describe. I was so fascinated to learn about your process when I visited your studio last summer. Please describe your current art projects for the biocreativity readers. 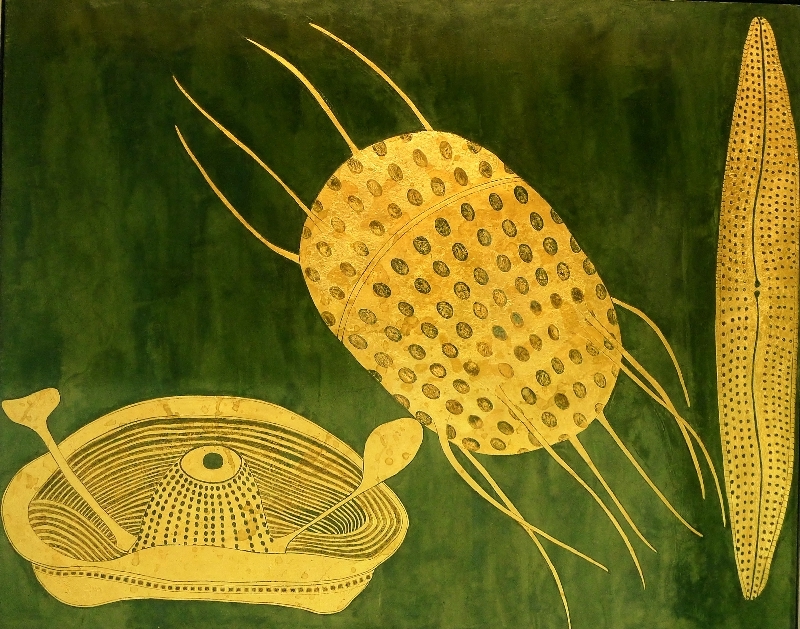 [KBF] In my paintings of the microscopic I spend endless hours looking at and reading about my subject. I read, I take notes, I study what they do and what they look like. For days, weeks, I look at hundreds of images, take notes on what they are, how they function, I sketch them, over and over and over, until I feel I have ‘gotten’ them. Then, all notes and sketches are put aside and I begin to sketch from memory. I compose the painting from memory with pencil and paper first. I make my own clay plaster paint and apply layers, with a small trowel, onto masonite. I then apply metal leaf to areas where my subject matter will be and then I etch into the leaf with a small, dental like tool. The details of my subjects are etched out of the leaf. The image there is from memory, it is not meant to give us a realist depiction but rather a human interpretation, through memory, of its most important aspects; its essence interpreted. My work with found wood brings to me a different process and outcome because it presents its reality to me in a much different way than a microscopic subject does. 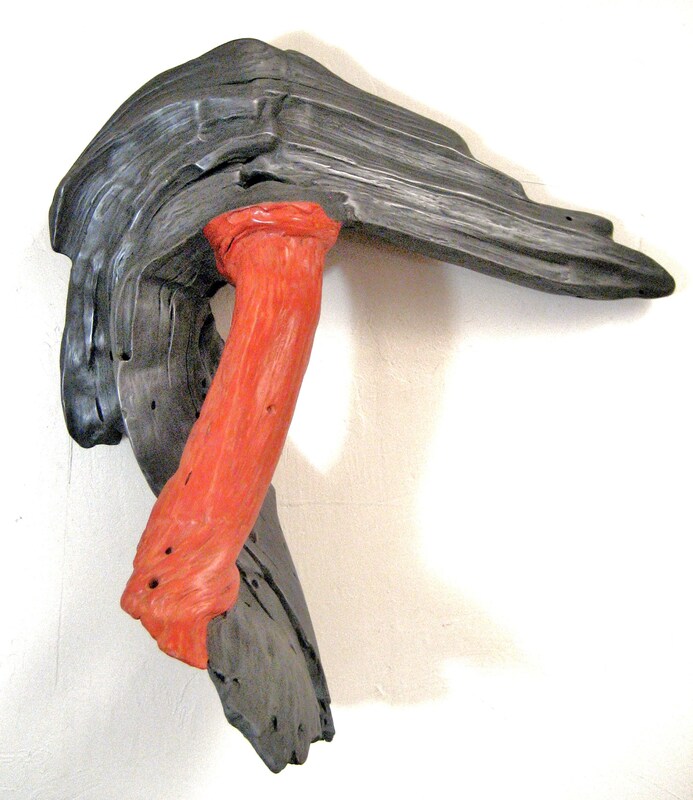 My wood pieces are found on my daily walks in New Mexico. I walk the rivers, arroyos, deserts and mountains of Santa Fe. I pick up decaying pieces of wood that visually jump out at me. I am struck by how they have been dramatically re-shaped by insects, time and weather. Their bodies reveal their history. I am aware that at that moment of picking them up and taking them to my studio I interrupt their cycle in nature. 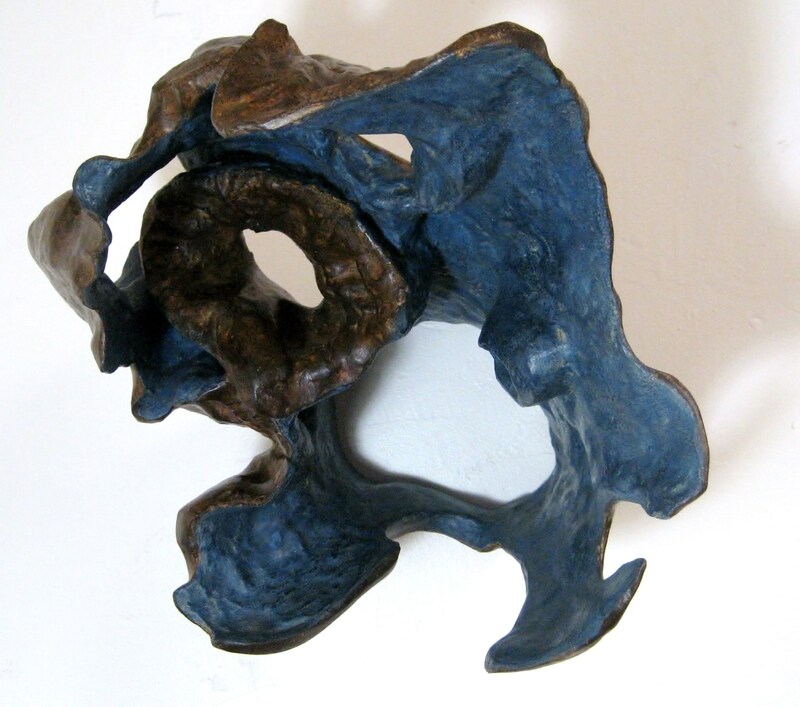 A collaboration begins when I thoroughly gut each piece of its soft rot and reveal the hard form; its core. This is a process of discovery because I cannot predict what will be uncovered; what will be left remaining. 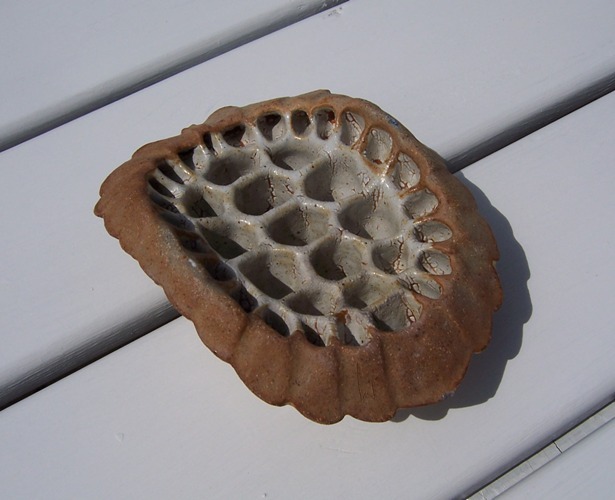 I then scrape and sand each piece and surround them in earth based mediums: clay, wax, metal. The process feels deeply ceremonial and ritualistic: from the selecting… to the ‘gutting’…to the re-working of the surface… to the ‘re-dressing’….to the mounting on the wall : subject and I go through a transformation. Katey Berry Furgason at work in her studio in Santa Fe, NM. [biocreativity] Katey, tell us more about the inspirations and motivations behind your work and practice. I am interested in art imitating the way in which we live; collaboratively. I am drawn to collaborations with nature. I want nature to guide my work, give me my set of criteria and physical facts. I am drawn to the process of discovery and not being in full control of the outcome. I need to be engaged with my environment. I believe life is fascinating and that beauty is everywhere and that it often goes unseen. I am filled with the desire to show people some of that beauty that often goes unseen. [KBF] The most important thing about my work would be this: once I am done with it, it is Yours. It is yours to interpret freely and personally, to attach whatever kind of meaning to it you wish, it has no ‘right’ interpretation. Once I am finished making it, it is itself fully offered to you. [biocreativity] I think that is a really important and generous point to make. Since part of our mission at Art.Science.Gallery. is to engage people in the science through the arts, I think about this a lot. We try to do this in a non-intimidating way, but I some people feel intimidated in an art gallery setting, so then our mission also becomes about helping break down “crutches” people have built up about not considering themselves to be very “sciency” or very “artistic”. Your statement above is something that I hope would feel very inviting to viewers of your work. Katey what’s next for you in art + science? Where do you see your current projects going, or what would you like to do next? [KBF] I will continue to explore the objects in the natural world around me. I am planning on doing several room installations – in which the walls will be covered with tree roots, mounted flush against it – bringing the outside in and directing our gaze and thoughts to what often goes unnoticed. I am still fascinated with how time, weather and insects act upon decaying pieces of wood, with how and where natural objects are in the ecological cycle. I never really know what the next work will be – one thing leads to the other – one discovery to the other. [biocreativity] Where can biocreativity readers find you on the web? [biocreativity] What is your advice to young artists and scientists who might be thinking about getting into art-science projects? [KBF] Focus on the process, always maintain integrity (make things well), and let the outcome be born out of it (allow the outcome, don’t force it). [biocreativity] Anything else you’d like to mention? [KBF] Art is life, it is engagement, it is collaboration, it is a process of discovery – you are a necessary part of that. It is your eyes, your heart, and your mind that bring it to life and sustain its meaning(s). [biocreativity] Katey, thanks so much for this interview! Readers, mark your calendars to see Katey’s solo exhibition, To The Heart, opening on Valentine’s Day 6-9pm at Art.Science.Gallery. at 916 Springdale Road, Building 2, #102, Austin, TX 78702. The exhibition runs through March 23, 2014. After months of blogging and meeting some amazing people and artist-scientists, I’ve been hard at work on opening a physical space that embodies this blog. I am so excited to announce the next big adventure here at the biocreativity blog: Art.Science.Gallery., LLC is finally here! While I’m still looking for the perfect physical location for the gallery, I’m really excited to be collaborating with some other spaces to present some really excellent science-related art. Our first exhibition opened this past weekend featuring the sustainable art of one of my past ECO Art + Science artists Emily Bryant! If you recall, Bryant creates intricate collages of invasive insect species out of pressed and dried invasive plant materials to help educate others about the risks associated with invasive species. We’re collaborating with the South Corridor Gallery @ First Presbyterian Church of Austin on the exhibition, and extend our sincerest thanks (especially to gallery manager Laurie Nelson) for the opportunity to share their space! So what is Art.Science.Gallery.? Well, it’s a new art gallery, science communication training center and (soon-to-be) event space featuring science-related art in Austin, Texas! Our mission is to provide a friendly environment to make science more accesible to the public through science-related visual arts exhibitions, foster the careers of emerging and established artist-scientists and to provide professional development opportunities for scientists to become more engaging public communicators. We reject the idea that one must be categorized as either an “artist” or a “scientist”, and welcomes anyone along a great spectrum of artists and scientist to explore and participate in Art.Science.Gallery.! Both those educated as “artists” and as “scientists” are trained to seek out novelty and contribute to their fields in new and exciting ways. We think those people who can innovatively blend the two disciplines have the best chance of improving art, science and social literacy around the world. One reason we opened Art.Science.Gallery. is to give these artist-scientists a platform through which to present their work and perspective from their place on the biocreativity continuum. As public funding for the arts and sciences continues to decrease, it is increasingly important to provide accessible multidisciplinary content that engages public audiences in these subjects. So, Art.Science.Gallery. encourages people of all ages to explore contemporary art and basic science in a fun and relaxed environment. Indeed, the Scientific American blog Symbiartic recently evaluated the growing science art movement, measuring its strength via the size of ScienceArtists FriendFeed (a multi-blog feed of many dozens of science-related art and artist blogs, of which the biocreativity blog is a part). This new science-art aesthetic seems to be testing the boundaries of both art and science to establish itself as its own field; a beautiful hybrid between art and science that once existed during Ernst Haeckel’s, Charles Darwin’s and John James Audubon’s times. Art.Science.Gallery. seeks to further this movement by directly fostering art-science collaborations and by featuring the work of both emerging and established contemporary artist-scientists. Art.Science.Gallery. will also serve as a hub for art-science collaborations and science communication training. We believe all scientists – especially those whose work is supported by public funds and/or at public institutions – have a responsibility to communicate their work effectively to the public. Unfortunately, relatively few colleges and universities offer specific training to their students in science communication. We will soon be offering training courses and workshops for scientists to help them become more engaging and creative public communicators as well as fun hands-on science-art classes for the public! So, I think you can tell I’m pretty excited about this, but that doesn’t mean that the biocreativity blog is going anywhere (and maybe now you can see why I haven’t posted as often the last couple of months)! Stay tuned for some new posts from scenic Colorado, as I’m traveling there for the next two weeks and plan to tell you all about Christo + Jeanne-Claude’s Over the River Project and some biocreative selections from the Denver Art Museum. If you’d like to join the Art.Science.Gallery. mailing list, please click on the image below. You can also find us on facebook.com/ArtScienceGallery and follow us on Twitter @artscigallery. And, feel free to help us spread the word! Hello Everyone! After a sort of crazy month buying our first house, packing, finishing some pottery for the show I’m about to tell you about while packing up the house, traveling internationally and moving (tomorrow! ), I’m a little down to the wire in announcing my total excitement about the Art From The Ashes (AFTA) benefit for the Lost Pines Recovery Team of Bastrop, Texas which opens tomorrow in Austin! I wrote about the Bastrop County Complex fires a couple of times last fall (click to read my original posts, The Art of Fire and AFTA Goes To Texas), which got me in touch with the amazing creative team at AFTA. I’ve had a great time collaborating with Joy, Stacy and Nina to curate an art-science exhibit that will be displayed within the exhibition space. I also had a blast creating a piece of pottery for the show (special thanks to Roxanne Hernandez of the Lost Pines Recovery Team for helping me get my piece fired when all of my pottery equipment was packed away! ), which you can view – along with art from over 70 Texas artists – at the show’s opening tomorrow, Saturday April 28, 2012 from 6-10pm at the Starr Building at 121 W. 6th Street (beween Congress and Colorado) in Austin, Texas. Gallery hours are 12-7pm until May 5th. There are several special events scheduled (details below) and all donations and proceeds from art sales will benefit the Lost Pines Recovery Team, a multi-faceted organization dedicated to reforesting and recovering the Lost Pines ecosystem of Bastrop, Texas. Not in Austin or can’t make it to the show? Dont’ worry – you can still donate to this wonderful cause by clicking here! The AFTA show has already garnered some great press in Austinist, Austin Chronicle and AltSounds. You can also see a TV spot this morning on local Fox Austin (channel 7.1) featuring Joy and some of the AFTA artists! The exhibition will showcase over 70 works of art donated by Texas based artists and ART from the ashes. In AFTA’s spirit of “Support. Inspire. Create. Renew,” works featured will incorporate materials salvaged from fire site locations in Bastrop County. This diverse spectrum of mediums will be further enhanced with the inclusion of a video installation of “Lost in the Flames” filmed by Andrew Shapter in Bastrop County, TX during September 2011, a unique art-science exhibit that will explore the creative ways in which artists have depicted fire ecology through the ages; and “Works On Wood” an installation created by Bastrop County’s youth utilizing reclaimed Loblolly pine. Proceeds support the efforts of the Lost Pines Recovery Team. Join us for an afternoon of Texas bluegrass music performed by The Lost Pines, one of the fastest groups on the Austin music scene. Performance by the Peterson Brothers Band. The Peterson Brothers combine the classic blues sounds of legends with their own unique blend of soul-infused inspiration. Proceeds from all programming support the Lost Pines Recovery Team’s restoration efforts of the Lost Pines Region of Bastrop County, TX. 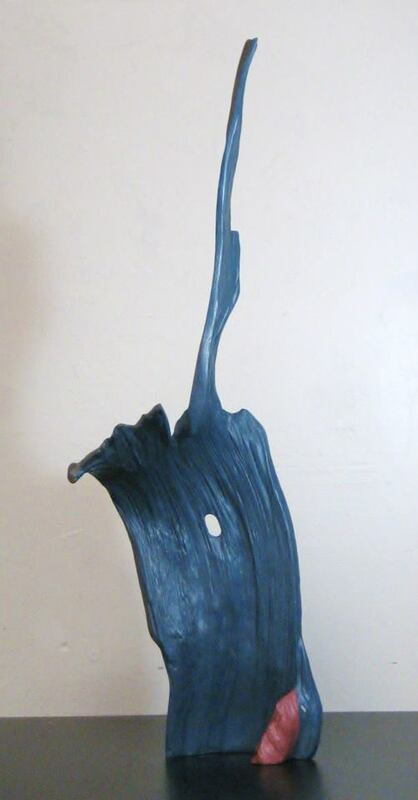 The Spring 2012 benefit to support the restoration of Bastrop County’s Lost Pines Region, will mark ART from the ashes’ sixth benefit exhibition since its inception in 2007. A recent trip to the Tennessee Aquarium in Chattanooga not only left me in awe of the power of aquariums, but I was also pleasantly surprised to come across two biocreative exhibits to feature on the blog! If you’ve never been to the Tennessee Aquarium, go right now! The focus on local watersheds, flora and fauna was beyond impressive. The diversity of reptiles and amphibians on exhibit was also beyond compare with any other aquarium I’ve visited. The first of the two biocreative exhibits I visited was Turtles: Nature’s Living Sculptures—Architecture in Bone, curated by Dave Collins who is also Curator of Forests at the Tennessee Aquarium. The second of the two exhibits – Jellies: Living Art – will be the subject of an upcoming post. I wish I had better photos to share with you, but I was limited to photography with my phone (with, unfortunately, no flash). But nevertheless, I think you’ll be able to tell how great this exhibit is! 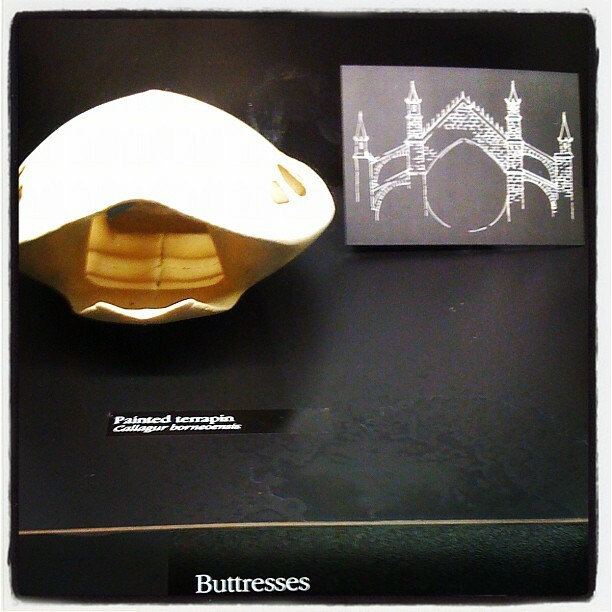 "The turtle shell is a masterpiece of architecture. 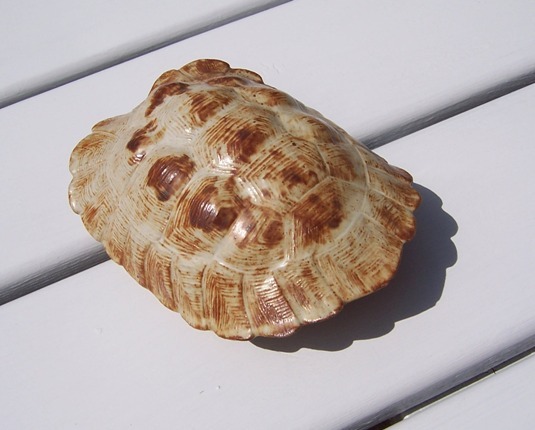 Like a Gothic cathedral, the domed shell provides maximum space within and the strength to withstand the ages." 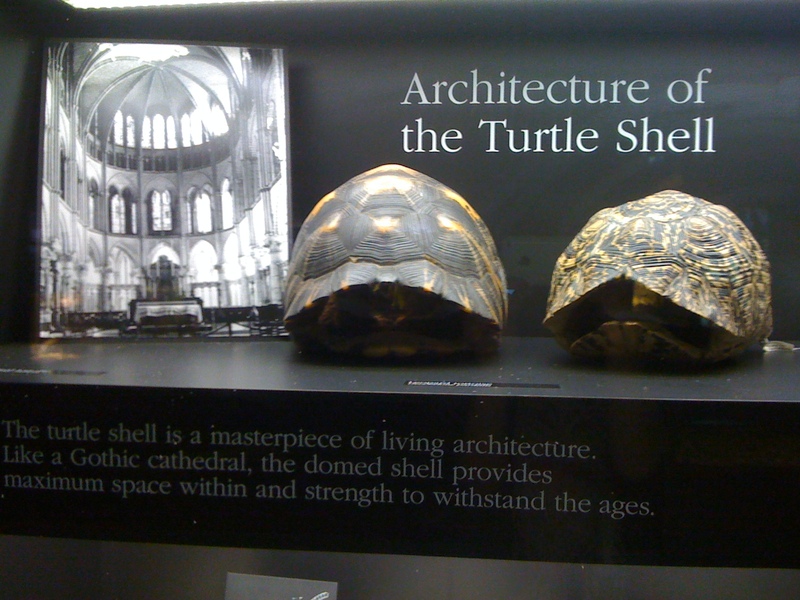 So, what do turtles and architecture have in common? Well, really, quite a lot! Arches, buttresses, geodesic domes, keystones…just to name a few. 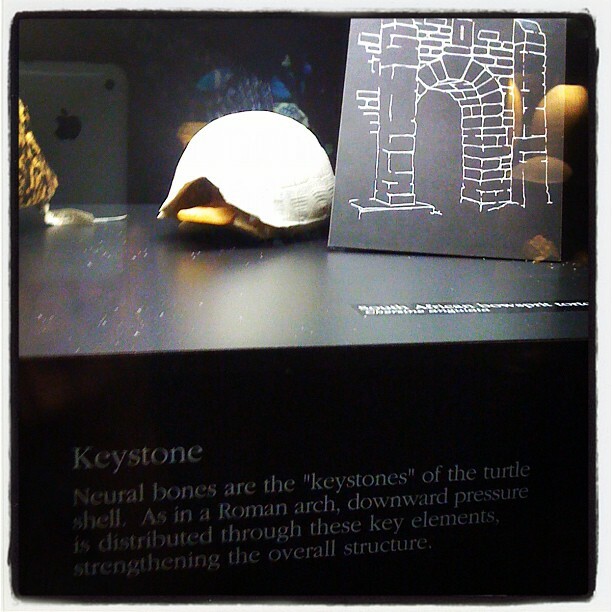 Several specimens of turtle shell were on exhibit alongside illustrations of these architectural elements, with really quite eloquent accompanying text. 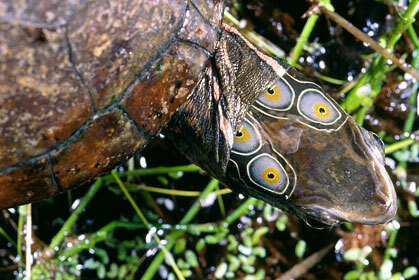 The exhibit featured live specimens of some of the world’s most beautiful and unusual turtle species – many of which I only knew from my herpetology books – including the South American Leaf-Headed Turtle or Mata Mata (Chelus fimbriatus) which has evolved to look like leaf litter and debris and the African Pancake Tortoise (Malacochersus tornieri) which can squeeze into incredibly tight spaces! To my delight, there was also a little homage to turtle sculpture from around the world (again, please forgive my poor little phone pics). Another nice touch in this exhibit was the addition of live Tennessee music by incredible acoustic musician and Aquarium employee Matt Downer. I enjoyed visiting with him, discussing the local music scene (since I am from Austin, after all!) and listening to his banjo play! University of Sydney architecture students learn how to build digital polygon models with a tutorial based on a turtle shell. Compilation of images from a University of Sydney School of Architecture, Design Science and Planning assignment. 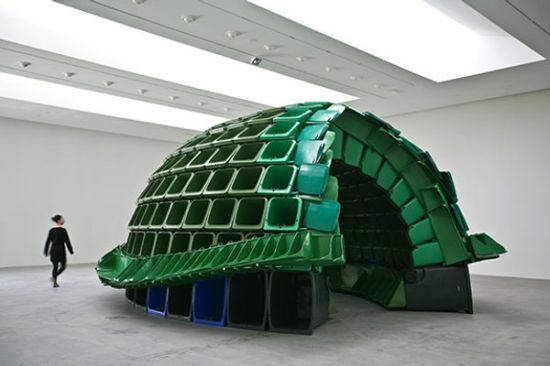 Canadian artist Brian Jungen created this impressive eco-art piece called Carapace, made from industrial trash and recycling bins. If you like this, be sure to check out his hanging mobile of animals made of luggage, 2008’s crux. Brian Jungen's 'Carapace'. 2009. Made from industrial waste bins, displayed at the Museum of the American Indian, Smithsonian Institution. Ceramic artist John Menzel (who also has a degree in biology) creates these amazing life-like turtle carapaces in his ceramics studio (and I hope he will soon be featured in the ECO Art + Science Series). 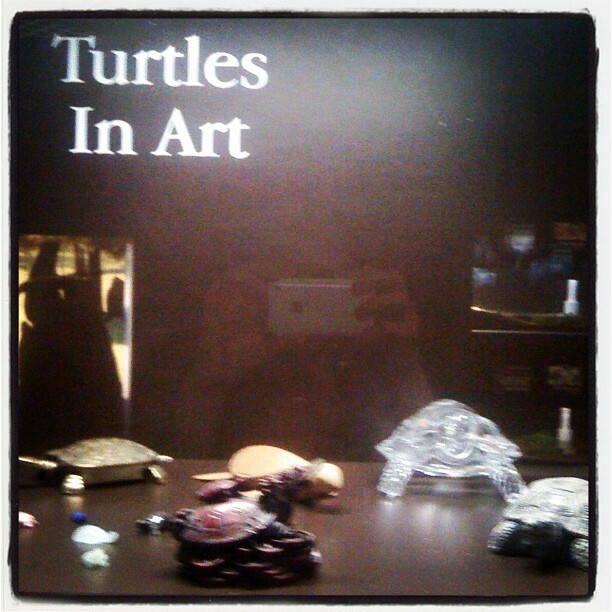 All-in-all, I am a big fan of turtle art in any form, including just the turtles themselves. This little guy – the Four Eyed Turtle (Sacalia quadriocellata) – was also on display at the Tennessee Aquarium, and is quite the work of art himself! And, if you’re a sucker for perhaps the cutest of all baby animals – turtles – then I’ll leave you with this fun video about baby Four-Eyed Turtles from the Tennessee Aquarium. But better yet…go see them for yourselves! Many thanks to the Tennessee Aquarium Conservation Institute for my very fun trip to the aquarium!